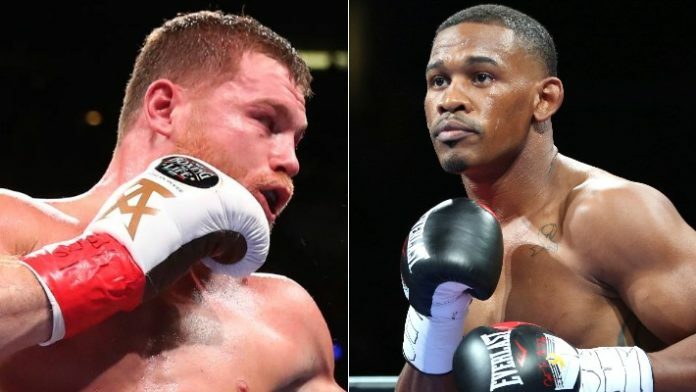 IBF middleweight champion Daniel Jacobs will attempt to dethrone Canelo Alvarez when they face off in Las Vegas on Cinco De Mayo. “I believe so. Canelo has got the power of the sport behind him if you like. You know, but Daniel Jacobs, now this is his moment and he really believes he’s going to win; we believe he’s going to win,” Hearn said. Jacobs is currently on a three-fight win streak at the moment. He won the vacant IBF middleweight title against Serhiy Derevianchenko in his last outing, winning via unanimous decision. He’ll take on Alvarez, who hasn’t been defeated since suffering his first and only defeat to Floyd Mayweather Jr. back in 2013. The heavy-handed Mexican currently holds the WBA (Super), WBC, The Ring, and lineal middleweight championships of the world. Alvarez hasn’t fought since capturing super middleweight gold against Rocky Fielding in December. Now, he looks to add another middleweight title to his collection by becoming just the second man to defeat Jacobs since Gennady Golovkin. What do you think about Hearn saying Jacobs will beat Canelo?